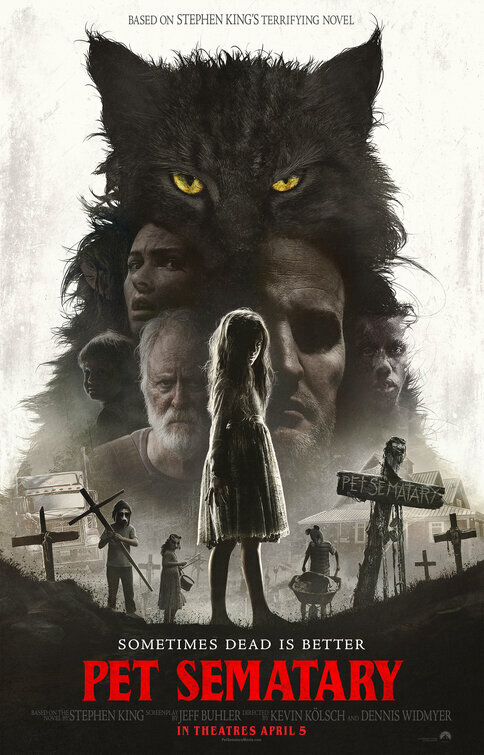 FILM REVIEW – PET SEMATARY. With Jason Clarke, Amy Seimetz, John Lithgow, Jeté Laurence, Hugo and Lucas Lavoie. Written by Jeff Buhler. Directed by Kevin Kölsch, Dennis Widmyer. Rated R for horror violence, bloody images, and some language. 101 minutes. Stephen King’s PET SEMATARY was always a dark and disturbing story, and one that even the author admits creeps him out. It’s about families and death and how, even with the best of intentions, nothing turns out right. It’s so pessimistic that King wasn’t sure if he should publish it, as it’s an attitude he doesn’t share. King wrote the screenplay for the 1989 film version, which stuck close to the book. This new take – credited to screenwriter Jeff Buhler (with a “screen story” credit by Matt Greenberg) – does as well, although there are several significant changes. One that local audiences will appreciate is that physician Louis Creed (Jason Clarke) and his family are now relocating to rural Maine from Boston rather than Chicago. At first they seem like an ideal family with Rachel (Amy Seimetz) the loving wife and mother, and their children Ellie (Jeté Laurence) and her toddler brother Gage (Hugo and Lucas Lavoie) their adorable children. When Ellie meets Jud Crandall (John Lithgow), an elderly neighbor, we might worry as to his intentions, but he’s a kindly and lonely local whom the Creeds welcome in. However when Ellie’s cat Church is run over by one of the oil trucks that go barreling by the property, Jud proves to have a deep understanding of local lore. Rather than bury the cat at the unofficial “sematary” that they have seen early on, he take Louis deeper into the words to a remote place which has special powers. Church comes back to life but much different from the friendly cat we’ve seen earlier. This leads the family down a horrific path when Ellie (rather than Gage, as in the earlier tellings) is killed and undergoes the same fate as Church. At that point the story becomes an even darker variation on King’s original tale, with an ending that is arguably more chilling. While the film touches on what might be considered serious themes, like what happens when we die and what children should be told about it, the focus is really on the horror. It’s not only the blood and gore, but seeing it take place within the dynamics of a family, particularly with young children. Clarke and Seimetz are sympathetic as the parents who find themselves increasingly as odds, and Lithgow is always a class act, providing some dignity to the role of a lovable old coot. Young Laurence, who already has an impressive resume for someone her age, is especially effective as both the normal Ellie and the version who comes back.